Most places in Europe when going ashore from an anchorage we leave our dinghy aka the flubber tied to a pontoon or quayside or even simply up the beach and know that when on our return it will be just as we left it. Likewise it can be tied behind Temptress overnight whilst at anchor and as long as it was tied securely it’ll still be there in the morning. That is not the case everywhere. 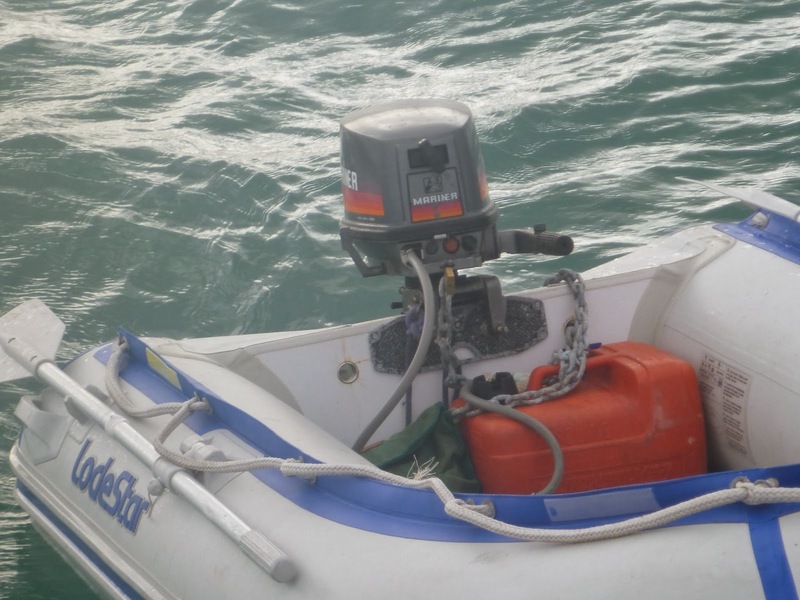 Dinghy and outboard thefts are common in many countries so, mindful of our dependence on these two fairly expensive if tatty bits of kit, we’ve been pondering for several months on how to secure them. All the equipment required was already on board (hooray a job that didn’t require a trip to the chandlers! ); a couple of padlocks (there is a box full we’ve been carrying around for years for just such an occasion), a length of anchor chain (usually attached to our stern kedge), some spare lengths of line and if needed a length of steel rigging with a loop in each end that was once used to secure my topper in Minima’s dinghy park. First task was to ensure the flubber would be secure at the dockside. There are plenty of warnings that dinghy thieves are well equipped with bolt croppers so the wire strop probably would only slow them slightly. Anchor chain on the other hand requires much more effort to cut even with the right tool so Kevin decided to use this. One end is now padlocked to the outboard’s lifting handle, threaded through the handle of the petrol can and out through the eyelet in the transom. Another padlock will secure a loop of the other end of the chain through a cleat on the pontoon or other mooring ring. When not in use the loose end can live in the canvas bag with the dinghy anchor, stowed by the tank. There are plenty of reports online too that tell of dinghies being stolen from boats in some idyllic palm fringed bay whilst their owners sleep. The thief simply rows or swims out to the anchored boat and cuts the painter with a knife. It is recommended especially in the Caribbean to lift a dinghy out of the water at night. Temptress has no davits at her stern nor would we want any as our dinghy usually lives on the foredeck when sailing. 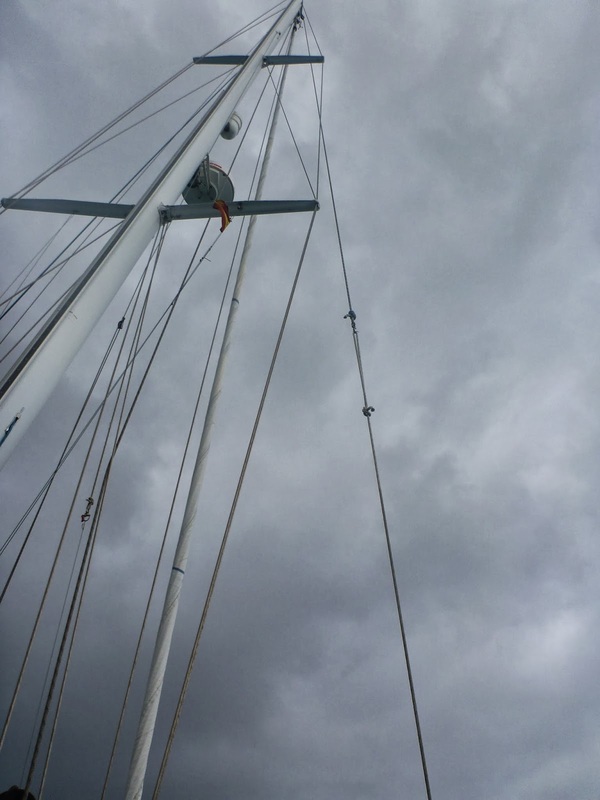 Lifting the flubber out with a halyard somewhere forward of the mast seemed a reasonable approach. However any system for lifting it out must be simple and quick otherwise we won’t bother to do it every evening before we retire to bed. Temptress’ topsides are too high to climb out of the dinghy or reach down into it at the point where we’d want to lift it. To make it easy the lifting strops have to be attached whilst the dinghy is at the stern of Temptress and be long enough to be held onto by someone on board Temptress as the flubber is manoeuvred forward. Kevin got out the bag of spare line (ie bits too short for mooring or spare halyards) and considered the problem. 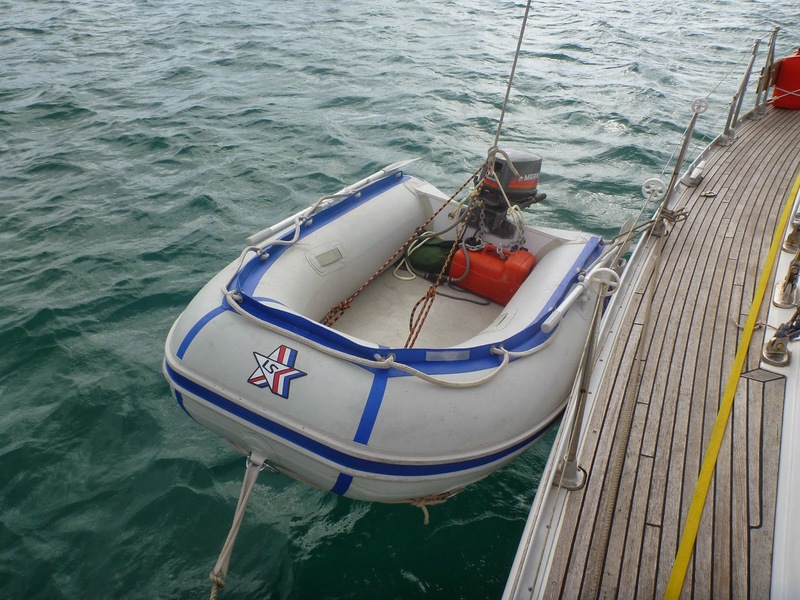 Our sturdy Dutch designed Lodestar has three hefty rings suitable as lifting points, one on the front of the bow usually used as part of the bridle set up for the painter and two low down inside on the side tubes towards the front of the dinghy. Aft there are eyelets on either side of the engine in the transom. It took a bit of tying and retying of two rope loops before we worked out where the centre of balance of the flubber lay. With the 5HP outboard on and an almost full tank of petrol it is surprisingly far back, only a foot or so forward of the engine! Each end of one piece of rope was tied to the two transom eyelets and a second longer piece was attached at either end to the inner lifting rings forward. A third line was then passed through the two resulting loops which in turn was attached to the starboard spinnaker halyard. With one person winching and the other acting as a whisker pole to push the halyard out over the centreline of the dinghy the flubber was gently and painlessly raised to be level with the deck well clear of the water. The painter, already secured to a bow cleat, was tightened up to prevent the dinghy flying off in any wind then the dinghy was additionally tied to a stanchion further aft to stop it banging around (it is after all now laying against the cabin where we sleep). The flubber rested neatly and quietly alongside, slightly stern down so that as long as we remember to remove the drainage bung any rain will simply wash the dinghy out. We removed the port hand oar so it won’t scratch the topsides if the dinghy does jig around. 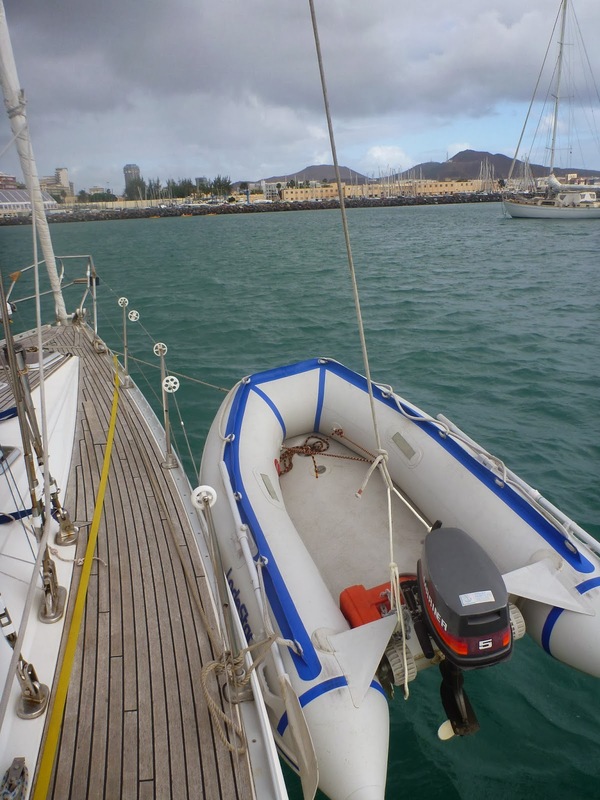 The only thing remaining would be to chain the dinghy to Temptress which will be easy now the dock security measures are in place but not needed here in Las Palmas. Any intending thief will now have to get on board Temptress without waking us to cut the flubber loose, having swum out armed with bolt croppers and I’m sure there will be easier targets. One bonus from all this is that spending time out of the water will restrict the amount of growth on the flubber’s bottom – already after only a week in the relatively cool seas here a certain amount of fauna has taken up residence and will require scrubbing off before we leave. The lifting lines could all be left in place whilst we are using the dinghy however once the system has been user tested a bit they may be replaced with tape strops, D rings and carabineers or quick release shackles to make it easy to remove when stowing for sea or leaving the dinghy on the dock where they might be stolen. PS: For other ideas for lifting your dinghy see these useful tips which we found afterwards!